he pioneer aviation era literally flew by, lasting just a little more than a decade from the first wavering flights at Kitty Hawk to the beginning of World War I. By this time "second generation" aircraft had begun to emerge, combining both maneuverability and stability. This rapid development is all the more remarkable when you consider that for the first few years, the Wright brothers were the only successful pioneers. A few visionaries in America and Europe made brief hops in a handful of airplanes, but nothing approaching the performance of the Wright Flyer in its final 1905 form. This despite the fact that these builders had access to the Wrights' published patents. It wasn't until the Wrights began demonstrating their airplane in 1908 that the rest of the world fully understood the necessity of three-axis control and how to use it. From that moment, aviation accelerated at an unprecedented rate – and for good reason. Across the globe, politicians were struggling mightily to maintain the "balance of power." Diplomacy had become a tangled web of treaties promising mutual aid in the event of attack. Germany was locked in an arms race with France and England. World war was imminent and the airplane looked to be a versatile and deadly weapon. 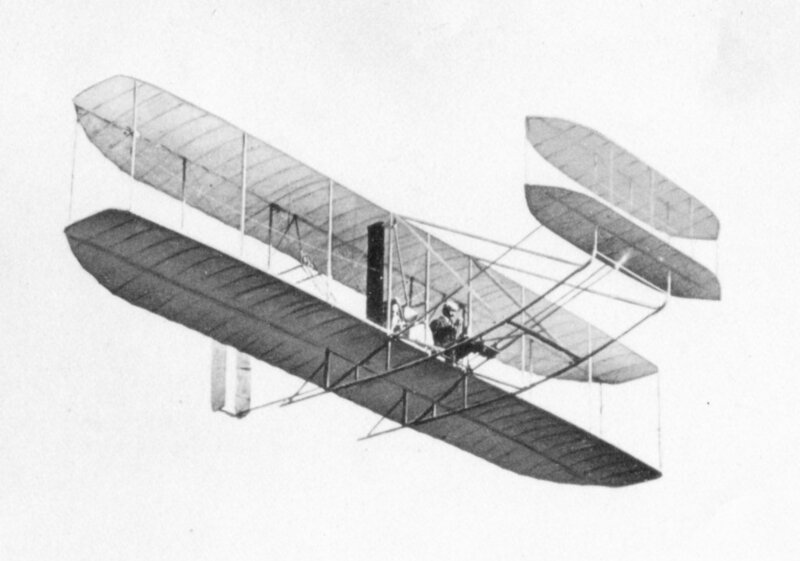 Landing Without Crashing, 1903 to 1905 – The Wright Brothers develop their temperamental Kitty Hawk Flyer into a practical flying machine. 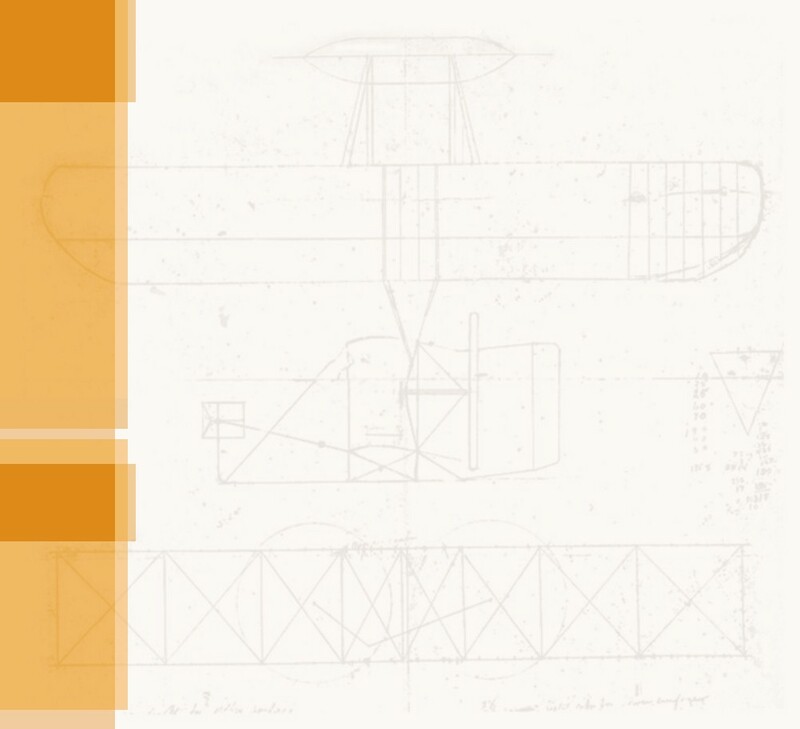 Wake Up Call, 1905 to 1909 – The Wright brothers' accomplishments alert aeronautical scientists and engineers in America and Europe to the possibilities of fixed wing aviation. Faster, Higher, Farther, 1909 to 1912 – Pilots and engineers begin to explore the capabilities and push the possibilities of aircraft. Girding for Battle, 1912 to 1914 – As the First World War approaches, nations develop the airplane into a weapon. January 3  The Aéro-Club de France offers a prize of 500 francs for the invention of an instrument that will indicate the horizontal position of an aircraft in flight. This will evolve to become the attitude indicator, the central instrument in a modern aircraft control panel. January 13  Henri Farman, France, wins the Grand Prix dAviation in his modified Voisin biplane, flying the first complete circuit in Europe. January 15 — Lt. Thomas Selfridge, secretary of the Aerial Experiment Association, requests information on Wright gliders, including their control system, and the the Wrights oblige him. January 27  The Wrights officially respond to the United States Department of War's request with a proposal to provide an aircraft and train military pilots. February — Louis Bleriot introduces the Bleriot VIII. Though unsuccessful at first, Bleriot makes modifications until the aircraft is capable to fly cross-country. More important, the airplane features a stick-and-rudder control system developed by Robert Esnault-Pelterie. The pilot moves a vertical stick with his arm to roll and pitch the airplane, and presses on pedals with his feet to yaw. This will become standard controls for future aircraft. 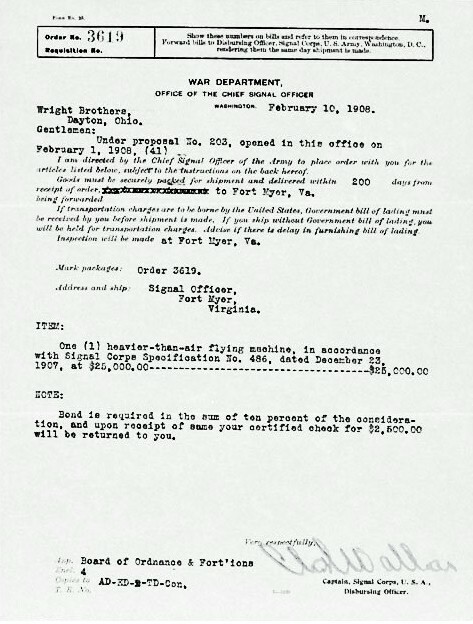 February 10  The Wrights sign an agreement with the US Board of Ordinance to deliver a two-seat aircraft for $25,000. 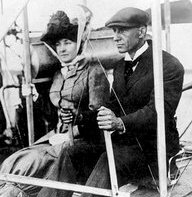 The Wrights also apply for a patent on a device to maintain the stability of an aircraft in the air, the first autopilot. 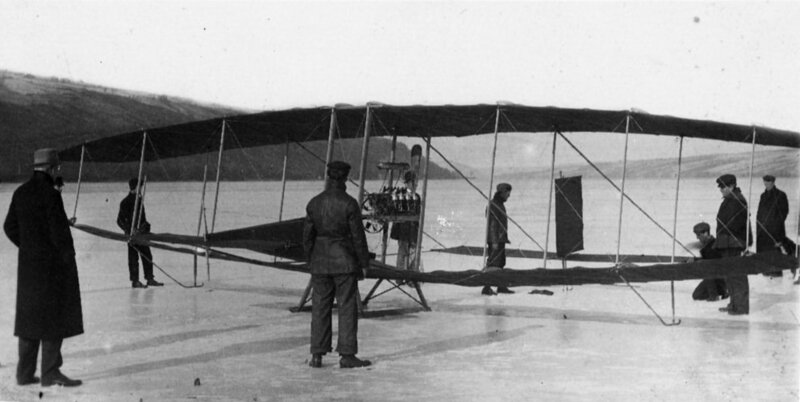 March 12  The Aerial Experiment Association tests its first plane, the Red Wing on a frozen lake in Hammondsport, New York. It makes a 319-foot (97-meter) hop and crash-lands. March 23 Charles Flint negotiates an agreement with Lazare Weiller and other French investors to manufacture Wright airplanes if the Wrights will come to France and demonstrate their Wright Model A.
April 9  Wilbur Wright returns to Kitty Hawk to practice flying before he demonstrates the improved aircraft they now call the Wright Model A. He is joined by Charley Furnas, a part-time employee of the Wrights. 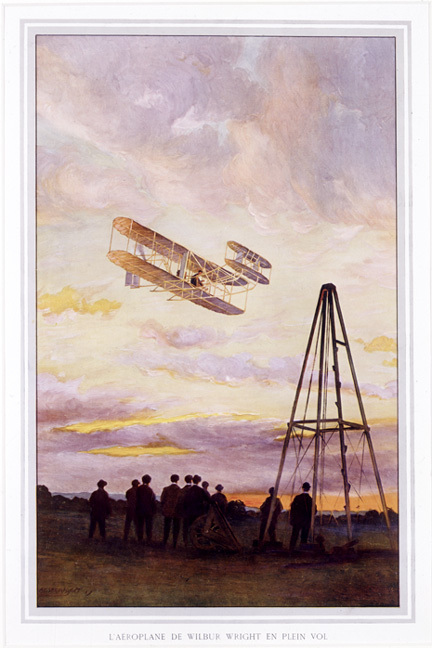 April 25  Orville Wright joins Wilbur and Charley in Kitty Hawk. May  Henri Farnam, France, challenges the Wrights to a fly-off for cash stakes  $5,000  for best speed and distance. When newspapermen confront Wilbur with the challenge, he characteristically has no comment. 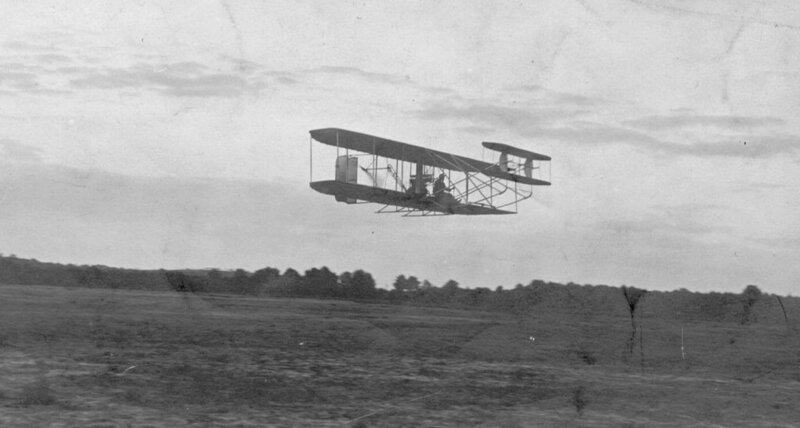 May 6  Orville and Wilbur resume flying tests. 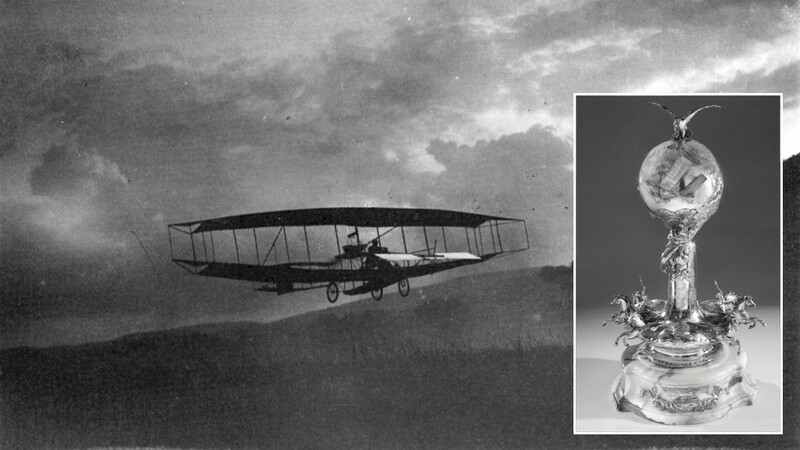 May 14  Charley Furnas rides first with Orville, then Wilbur, making the first true passenger flights. May 20  The Wrights divide their forces  Orville to Fort Meyer, Virginia to demonstrate a Wright Model A for the US Army, Wilbur to France to demonstrate on for the French syndicate. 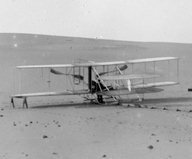 May 19-21  The Aerial Experiment Association tests its second plane, the White Wing with Lt. Thomas Selfridge at the controls. He eventually makes a 1017-foot (310-meter) flight and lands safely. It is the first time a member of the US Armed Services has piloted an aircraft. June 8  Wilbur Wright arrives in Le Mans, France and joins up with Hart O. Berg, Charles Flint's agent in Europe. Léon Bollée, who owns an automobile factory there, has graciously lent Wilbur space to assemble their airplane. When Wilbur unpacks the boxes, he finds that the Wright Model A that was shipped to France in 1907 was extensively damaged by French Customs officials. He begins to repair it with hired workmen in a corner of Bollée's factory. 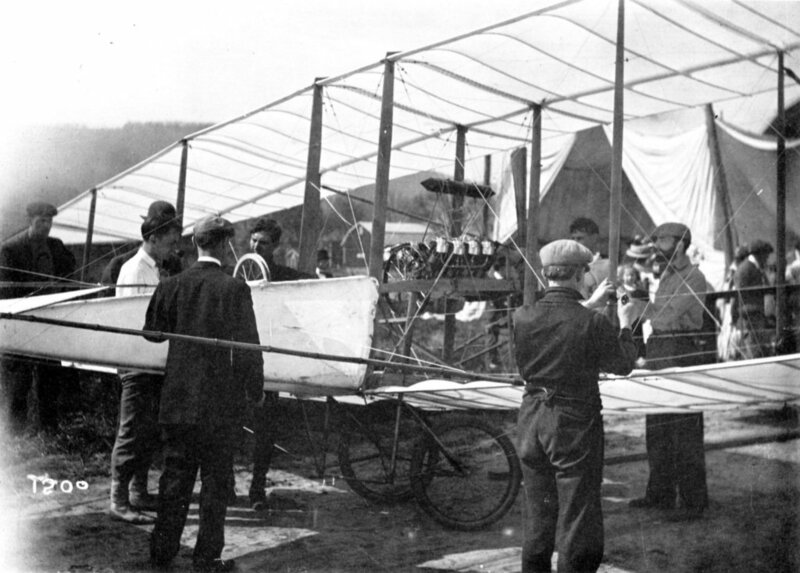 July 4  The Aerial Experiment Association wins the Scientific American prize with the June Bug piloted by Glenn Curtiss. 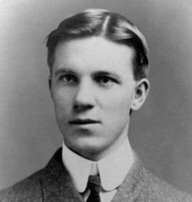 That same day, Wilbur Wright is badly burned in France when a radiator hose explodes. 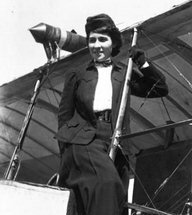 July 8  Therese Peltier, a French sculptress, flies for a short distance with Leon Delagrange in Turin, Italy, becoming the first woman to fly. Later, she becomes a student pilot of Delagrange but gives up aviation when he is killed. July 20  Hearing of Curtisss success, Orville writes the Aerial Experiment Association. reminding them that they are welcome to experiment, but if they want to manufacture planes or fly them for profit, they must lease the Wrights' patents. August 8  With the French press taking pot shots at the Wrights, Wilbur decides "it would be a good thing to do a little something," even though the Wright Model A is not quite ready. A crowd gathers at the Le Mans racetrack, including Blériot, Archdeacon, and other French aviators. Wilbur makes a flight of almost 2 minutes and the French are won over. Says Delagrange, "Well, we are beaten." Blériot says, "Monsieur Wright has us all in his hands." Only Archdeacon is a little sour. 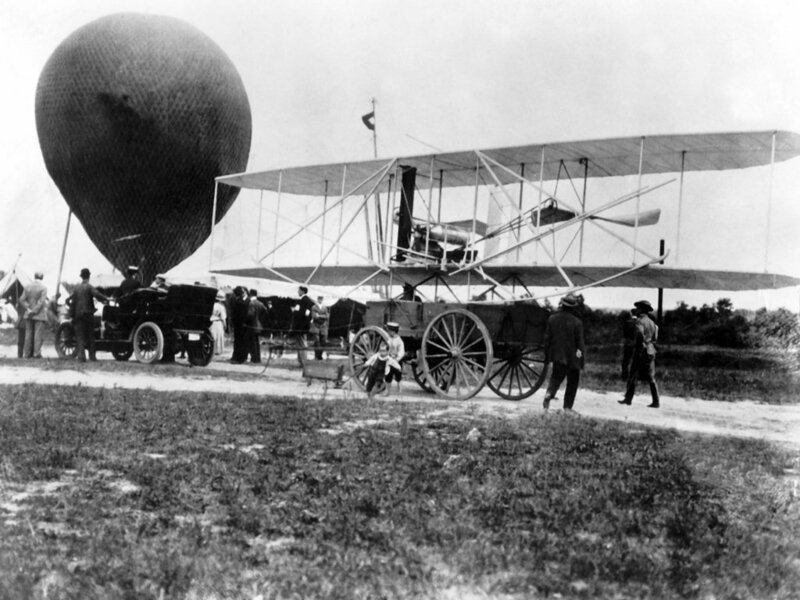 August 21 — Orville Wright arrives at Fort Myer with a Wright Model A and CharlieTaylor and Charley Furnas to help him put it together. 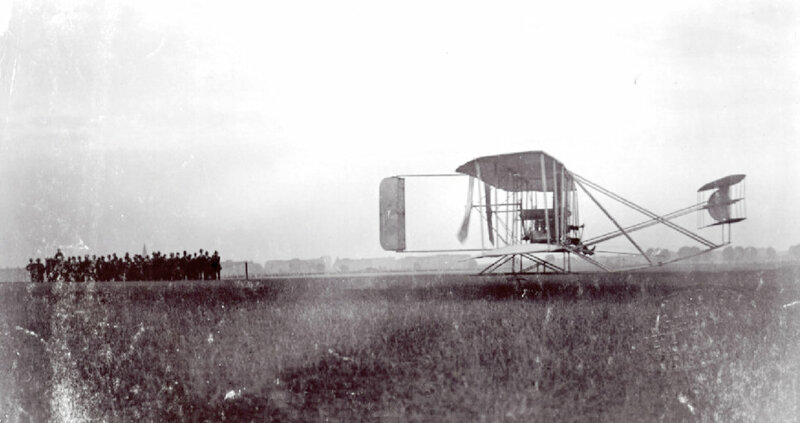 September  Century Magazine publishes "How We Invented the Airplane," by Orville Wright. 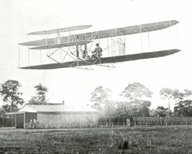 It is the first popular account of the Wright story from their first aeronautical experiments to their achievement of a practical flying machine. 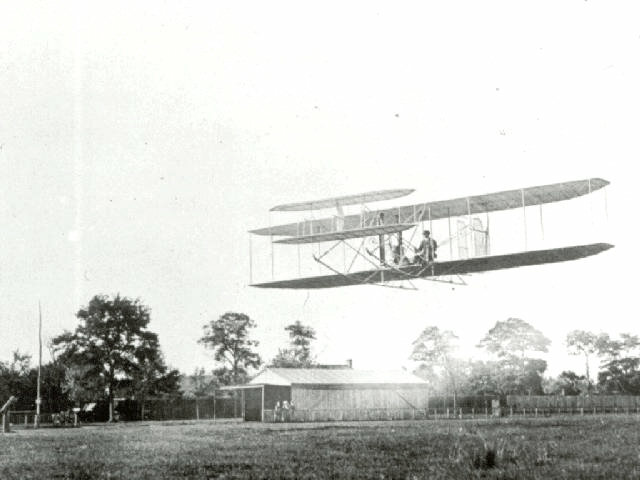 September 3  Orville Wright begins flying demonstrations at Fort Myer, Virginia. September 5 — In his newspaper The Daily Mail, English publisher Lord Northcliffe offers a prize of £1000 ($5000) for the first aviator to fly the English Channel. 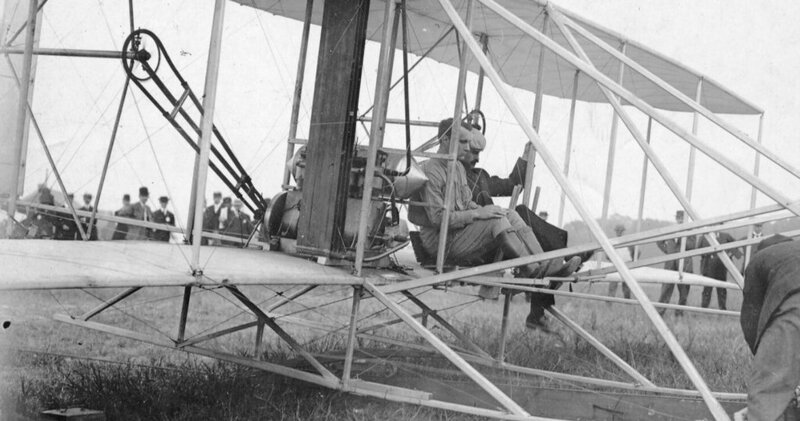 September 17  Orville flies with Lt. Thomas Selfridge in Fort Meyer. A propeller breaks, the plane crashes, and Selfridge is killed. Orville suffers a broken leg and hip. September 18  Katharine Wright takes a leave of absence from her teaching job to tend to Orville. She is joined in Washington by Charles Flint. September 21  Wilbur Wright sets a new world record for time aloft, 1 hour and 31 minutes. He does the best flying of his life in the months that follow, knowing he has to give the press something to talk about besides Orvilles terrible crash. He sets new records almost daily. Fall  Wilbur Wright takes French photographer L. P. Bonvillain aloft to snap the first aerial photographs. 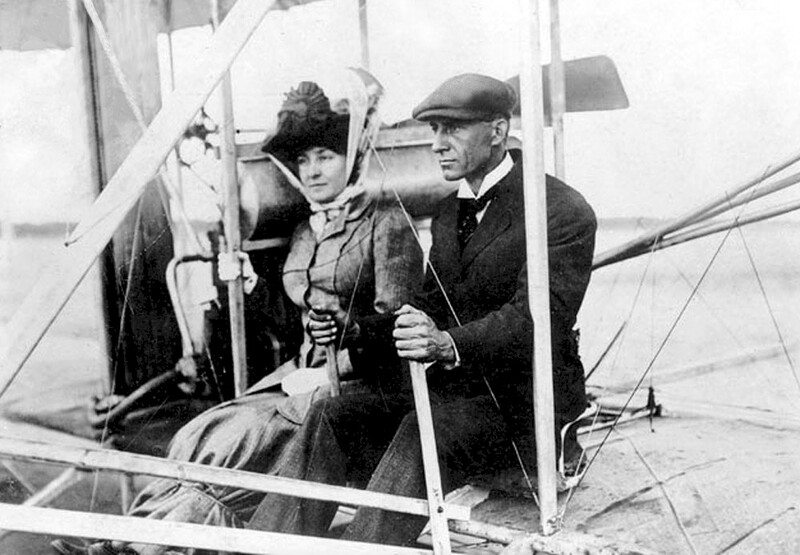 October 7  Wilbur Wright carries the second woman passenger aloft, Mrs. Edith Berg, Hart O. Berg's wife. October 16  American expatriate Samuel Cody flies British Army Aeroplane No. 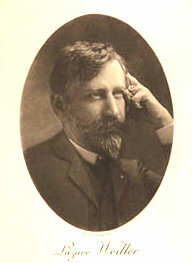 1, which he helped to design and build. 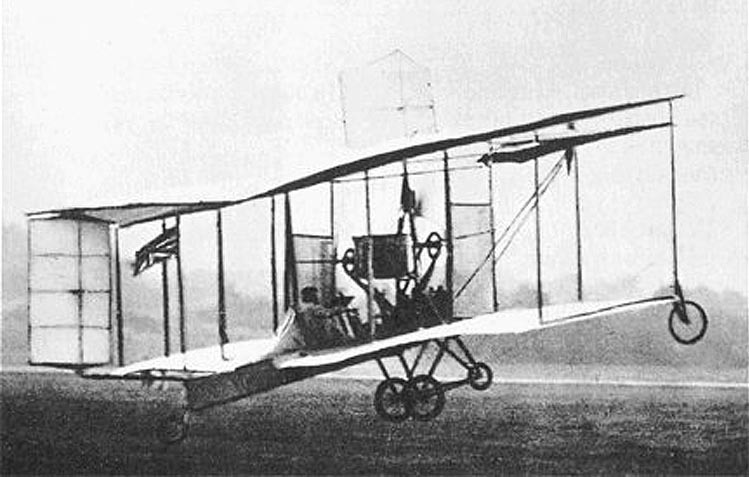 His is the first powered flight in England. 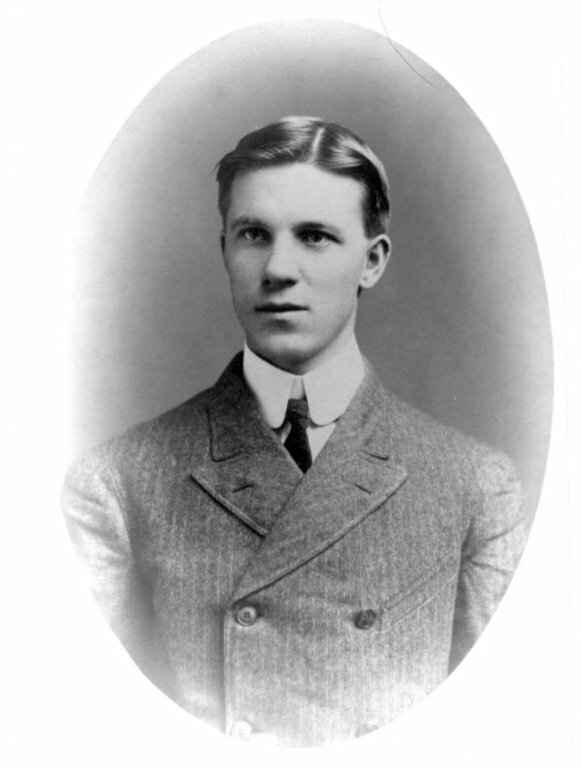 October 28 Wilbur Wright begins training the first student pilot, Count Charles de Lambert. 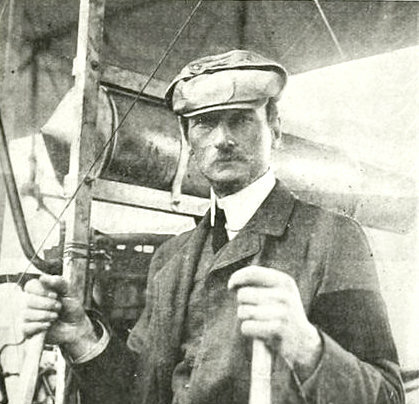 October 30  Henri Farman, France, makes the first cross-country flight, traveling 27 kilometers (17 miles) from Camp de Chalons to Reims. 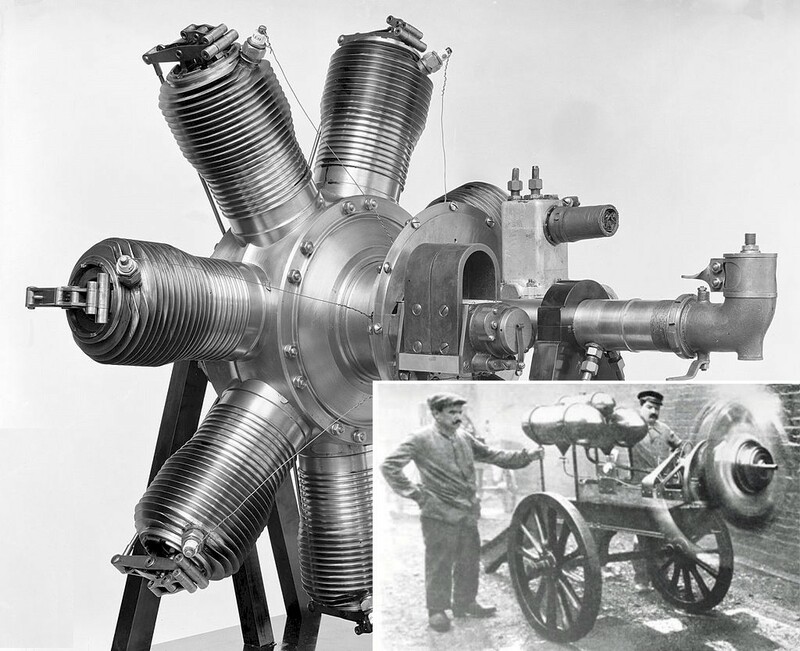 November  The Seguin brothers, France, unveil their Gnome rotary engine in Paris. November 1  Orville Wright and Katharine arrive back in Dayton, Ohio after Orville has spent nearly six weeks recovering in Washington DC. 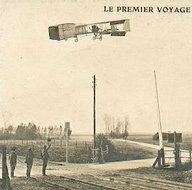 November 30  La Compagnie Générale de Navigation Aérienne, the French syndicate that organized under Lazare Weiller to produce Wright airplanes, officially opens for business. December  In his book War in the Air, author H.G. Wells predicted the horrors of a war waged with airplanes. 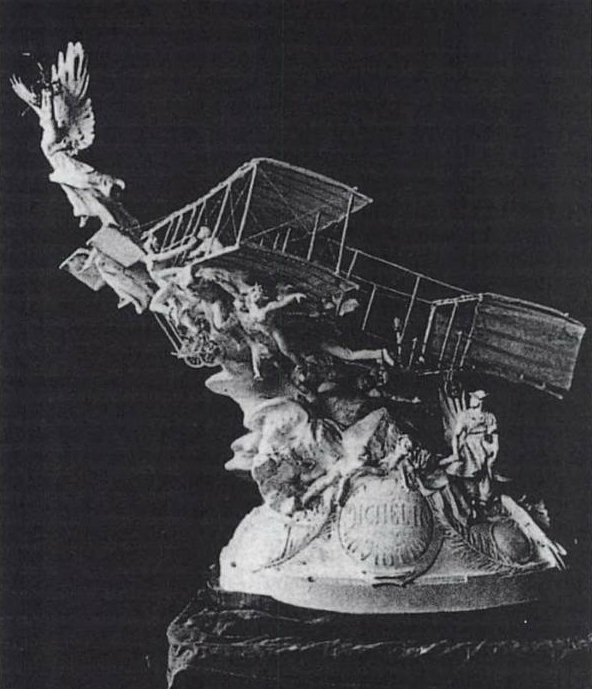 December 31  Wilbur Wright wins the Coupe de Michelin after setting a new world record for duration and distance, flying 124 kilometers (77 miles) in 2 hours and 20 minutes. 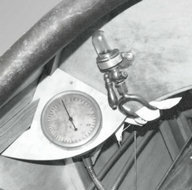 Early aircraft had no instruments to gauge attitude, altitude, or to help the pilot navigate. 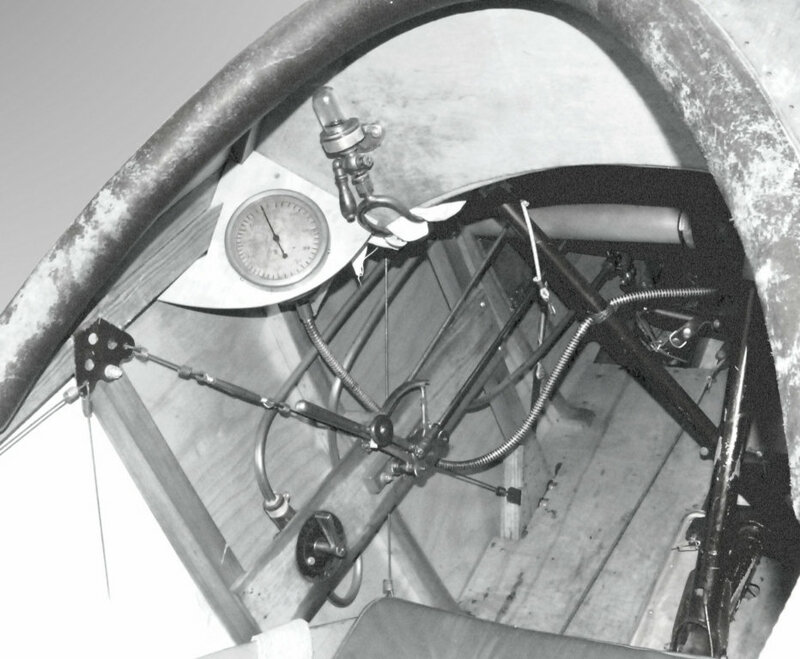 This early Bleriot has nothing more than a glass tube to monitor the oil level in the engine and a tachometer to report engine speed (RPMs). 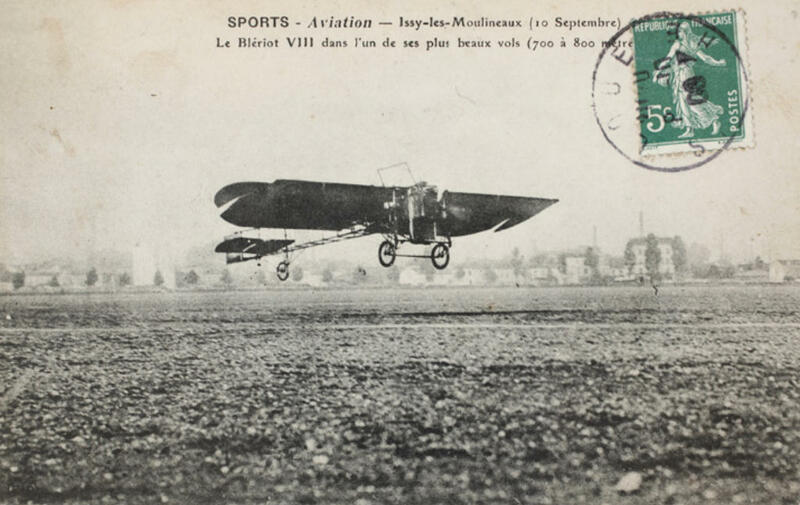 The Bleriot VIII in flight at Issy-les-Moulineaux where Bleriot and other early French aviators made many test flights. The AEA's Red Wing had arched wings – the top set at an anhedral and the bottom at a dihedral. 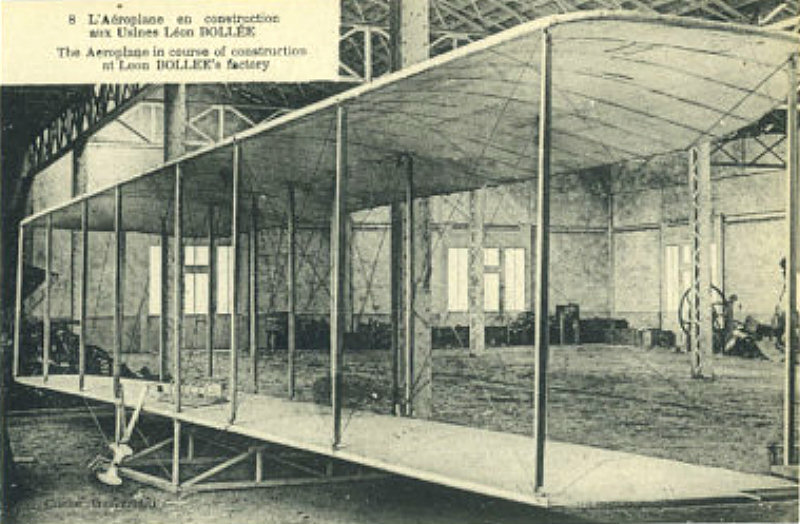 Its designer, Lt. Selfridge, reasoned this was a stronger construction than standard flat wings. 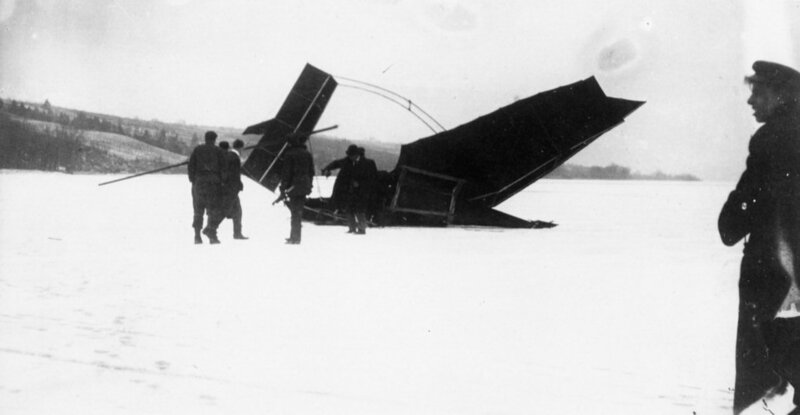 The Red Wing took off from the ice powered by a motor built by Curtiss. While making its second flight, the Red Wing crashed and the AEA went back to the drawing board. 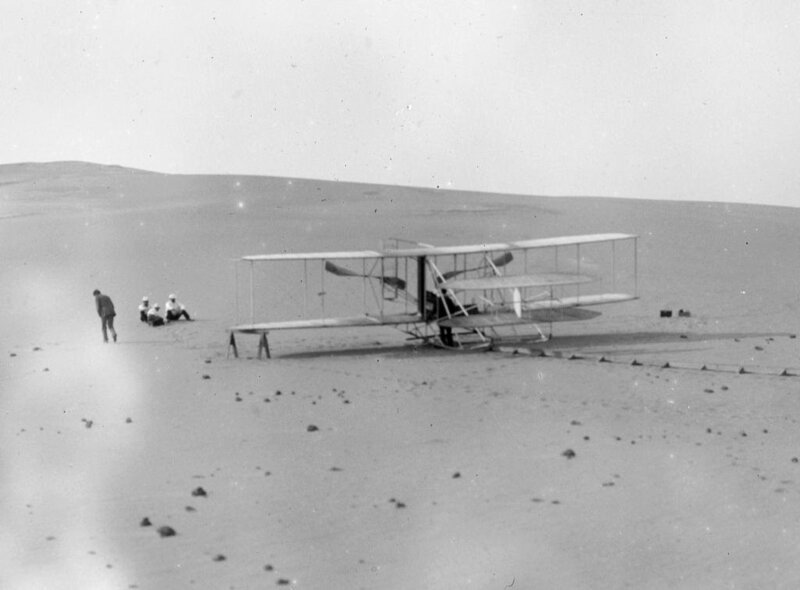 The Wright Flyer III in Kitty Hawk in 1908, with a more powerful motor and a bench seat to accommodate a pilot and a passenger. The AEA White Wing was piloted by Lt. Thomas Selfridge, making him the first US military man to pilot an airplane. 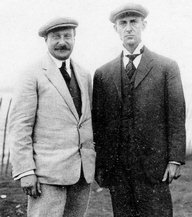 Hart O. Berg (left) with Wilbur Wright (right). 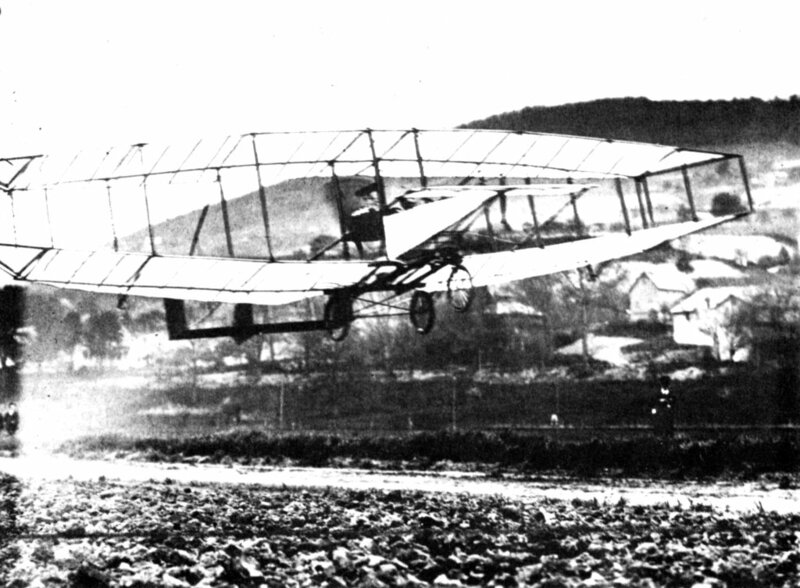 The June Bug was designed and piloted by Glenn Curtiss. 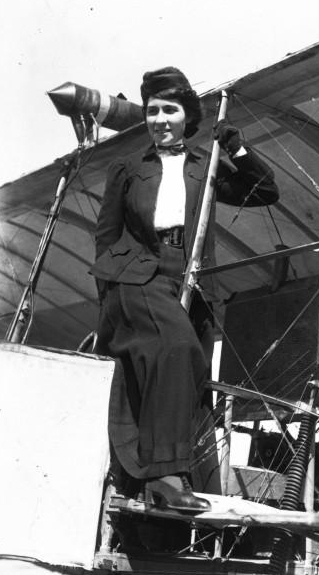 In addition to being the first woman to fly, Therese Peltier may also have been the first woman to make a solo flight as pilot. Wilbur flying at LeMans. The grandstands are just to the right of the hangar/shed. 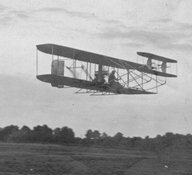 Orville Wright flying at Fort Myer. 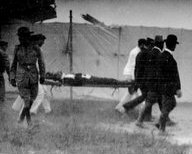 Orville Wright is carried off the parade grounds at Fort Myer past the wrecked Flyer. Wilbur brings the Flyer in for a smooth landing before a crowd that has gathered to watch him fly. British Army Aeroplane No. 1 was neither a tractor or a pusher. Cody positioned the propellers between the wings. Count Charles de Lambert was a Russian aristocrat with French roots. Paul Roussel, the sculptor who designed the Michelin Cup, originally included a Farman biplane. He replaced this with a Wright Flyer when Wilbur won the cup on the last day of 1908. 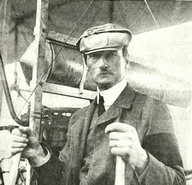 Henri Farman nudged his Voison aircraft around the circular course at Issy-les-Moulineaux in France using the rudder alone. He had no roll control. 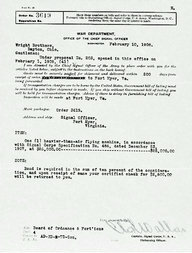 The purchase order the the first US military airplane, signed by Gen. Charles Allen. Lazare Weiller was not just an industrialist. He was also an inventor and a visionary. He later wrote a book titled From Montgolfier to Wilbur Wright. 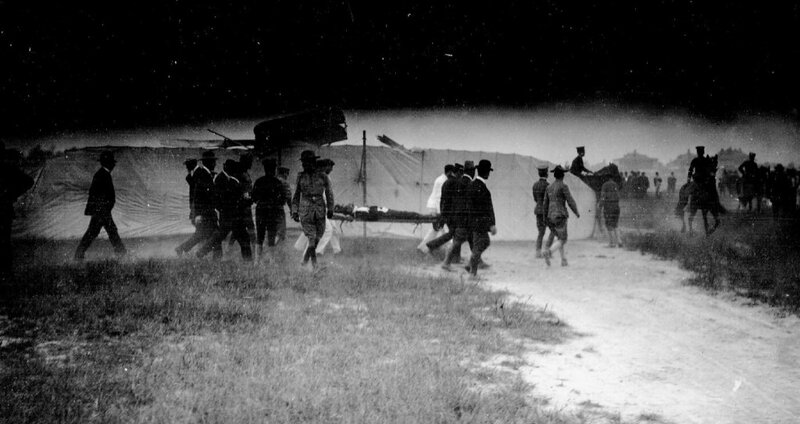 Although two French aviators had taken passengers aloft before May 1908, Charley Furnas was the first to ride in an aircraft designed for that purpose. A close-up of the White Wing. Neither the Red Wing or the White Wing had any means of roll control. The Wright Flyer comes together in Léon Bollée's automobile factory. Although the June Bug had primitive ailerons, it could not turn. Nonetheless, it managed a straight 1-kilometer flight to win the Scientific American trophy. 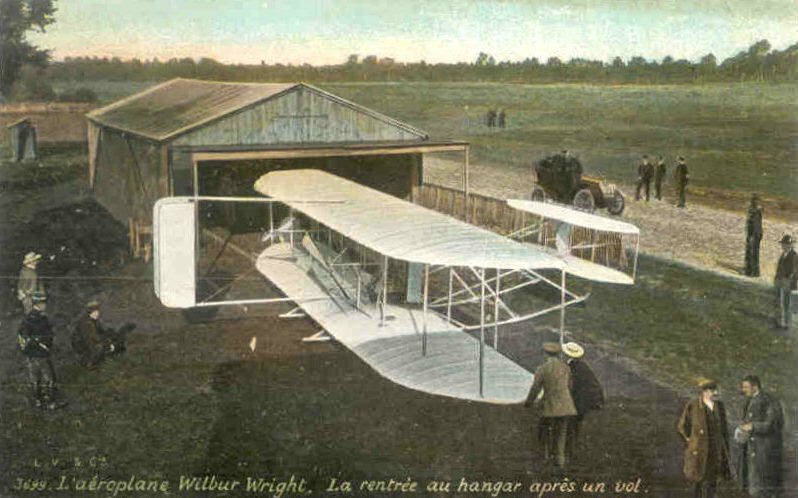 After assembling the Wright Flyer at Bollée's factory , Wilbur moved it to a shed on the LeMans racetrack. 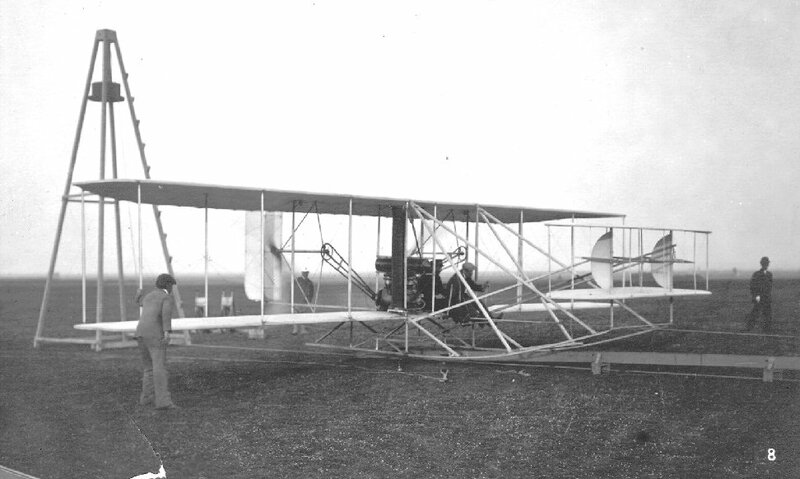 The Wright Flyer poised on the launch rail at LeMans. 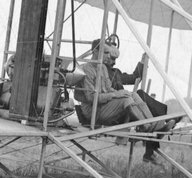 The Wright Flyer arrives at Fort Myer, VA.
Lt. Thomas Selfridge in the cockpit with Orville Wright just before take off. 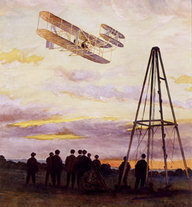 A painting of Wilbur Wright flying at sunset in LeMans. Edith Berg with Wilbur just before take off. Mrs. Berg's skirt is tied below the knees to keep it from blowing back. 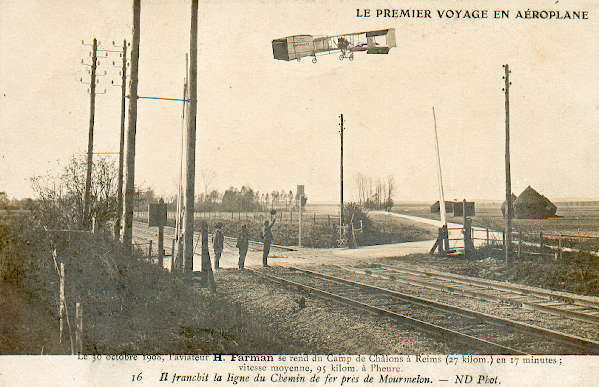 Henri Farman on his way to Reims from Camp de Chalons. A Gnome rotary engine on a test stand. The whole engine revolved, cooling the cylinders and evenly distributing the lubrication.